Northend U13s were the toast of the club at the weekend after a 5-3 victory over neighbours Ballymena United at Smithfield. Elsewhere in the Lisburn League the U14s and U16s lost their League matches against Lisburn Youth and Banbridge Town by single goal margins. The younger competitive teams had a mixed bag of fortune in the North West and Coleraine District league with the U12s beating Roe Valley by a 3-0 scoreline , the U11 United team drawing a high scoring game with Maiden City and the U10s and U11 Youth teams losing their matches against Institute and Ballymoney United in close fought encounters. The U8s started off the weekend with three teams again representing Northend on Friday night at the Irish FA Small Sided Games Tournament held at the Showgrounds. This was followed on Saturday morning by the U9s who travelled to Larne this week where the IFA Small sided Games tournament was held at the newly opened Wellington Rec 3G pitch. The Club was again represented with three teams at this age level, showing the strength in depth of the Club’s youngest teams. The ever growing SSG’s for U9’s organised by the IFA on Saturday morning moved to Wellington Rec Larne to coincide with the official opening of their new 3G pitch. In a different format this week, Northend United where the only team to progress to the semi final stage but unfortunately came up short losing 2-1. Some great football played by all 3 teams. Northend Pumas Panel: C Martin, P Murphy, P Martin, C Lutton, T Hasson, R Dunne, C O’Hara and C Reid. Northend United 3, Institute 5: Northend were rocked by conceding two goals inside the opening 15 minutes and a nother quickfire double left them four goals adrift before Jay McKeown pulled one back before half-time. Lee Turner reduced the deficit further after the break but Institute added a fith before Turner’s second goal rounded off the scoring. MOM - Lee Turner. Northend: PJ McDonnell, R Campbell, S Bristow, B O’Neill, J McKeown, S O’Broin, E Mitchell, L Turner, O Kerr, Z Erwin. Northend United 4, Maiden City 4: A frantic first half saw Northend lead 3-2 with goals from Kevin Cosgrove (2) and Lewis Hector. Hector scored his second to put Northend 4-2 up early in the second half but Maiden City scored twice to secure a point. MOM - Lewis Hector. Northend: E McSparron, D Magill, P Bristow, J Adams, K Cosgrove, C McMillan, O Campbell, J McIlhatton, L Hector, C McMurray and D McKay. Northend United 1, Ballymoney United 2: Northend looked the stronger side in the first half, so it was disappointing that Ballymoney made the most of a counterattack, and a Northend defensive error to open the scoring. In the second half, the Northend defence worked hard and Caolan Lennon made a couple of super saves, but another defensive mistake cost them when Ballymoney scored their second. Northend they finally got the goal they deserved when Connor McKillop was in the box to connect with the ball and put it beyond the goalkeepers reach. MOM - Ben Harkin. Northend: C Lennon; D Killough; C O’Brien; N Devine; B Harkin; J Connor; C Martin; C Mellon; C McKillop; L Allen. Northend United 0, Institute 1: This week was slightly different with Northend U12s playing 2 games both 20 minutes each against Institute and Roe Valley. The first game against Institute was all Northend but the north west side grabbed the only goal against the run of play. Northend United 3, Roe Valley 0: Just 20 minutes after the Institute game finished, Northend were back in action and they found the net early on with a fantastic strike by Pat Ferris. It was quickly 2-0 through Jamie Morrow and then shortly before the end Jamie Montgomery made it three at the back post. Northend: E McSparron, C Higgins, J Morrow, C McGaughey, J Montgomery, P Ferris, A Campbell, R McKillop, R McQuillan, C Kilgore. (C). 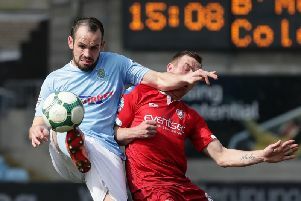 Ballymena United 3, Northend United 5: The first meeting between these teams proved a memorable one, starting in the opening minute when Adam Mooney finished off a great move and it got better after five minutes when Connor Meeke cut in from a left wing position to blast a unstoppable shot into the roof of the net. Ballymena pulled one back from a corner then Northend went further in front when Conor McDonald scored a screamer again from outside the box. Ballymena reduced the deficit before half time while Northend hit the crossbar from a Conor McDonald shot. Northend again hit the crossbar before finally settling the tie when Jay Kirkpatrick scored from close range from a corner with minutes just remaining. Northend: J Givens, C Forsythe, J Coates, R Dunlop, J Kirkpatrick, R Gamble, C Meeke, C McDonald, R Mark, A Mooney, M Stewart, C Metrustry, R Boomer, L Watson. Lisburn Youth 2, Northend United 1: Northend looked like a team that had both trained and played little over last 6 weeks and Lisburn took full advantage as they went ahead after a scrappy goal. Northend: C McGarry, R Jones, S Lecky, S Frew, R Lorimer, N Craig, R Iovu, M Willighan, T Patchett, C Gordon, T McAuley, C Fullerton. Banbridge Town 3, Northend 1: After falling behind in the first half, Northend levelled when Sam Bennett ran at the Banbridge defence and unleashed an unstoppable shot which hit the underside of the crossbar. It bounced down and was only partially cleared to Jamie Houston and his shot was parried by the keeper but found Cameron Neilly at the backpost who coolly slipped the ball into the corner of the Banbridge net but Northend conceded twice more in the last five minutes.